Spectra (Germany) offers the Unistream USP-104-M10 PLC (programmable logic controller) with integrated HMI. It comes with a CAN interface and supports CANopen. A PLC is the first choice for every user to implement control tasks. 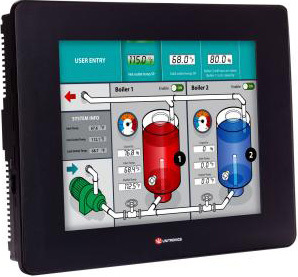 For operating and monitoring they additionally use an HMI (human machine interface) device. With the Unistream USP-104-M10 from Unitronics, Spectra offers a PLC with integrated HMI. This control solution combines various functions in one housing. It comes with a 10,4-inch multi-touch display, which allows a five- or ten-finger operation. The product can be extended by means of analog and digital input/output modules. A maximum of five modules are attachable directly to the display unit by means of a plug connection. Further I/O modules with analog and digital ports can be connected remotely via CAN network or locally by an I/O expansion bus. The controller supports up to 2048 I/O channels. The CAN interface complies with CANopen. The programming of both the HMI and the PLC is carried out via the free-of-charge Unilogic Studio development software. This graphically oriented programming software reduces the programming effort, claims the company. Ifm offers a SIL-2/PL-d-compliant host controller. The unit features four CAN interfaces.